So much of the negativity and tension we experience throughout the year – and during the holidays – has to do with what we say and hear from others. In the age of digital media, it has become so commonplace for people to post, tweet or video whatever they want, without considering the social, emotional and energetic impact of their words. When we say something kind to someone or about something, we are creating a higher energetic vibration that heals hearts and sustains relationships. Words can be swords or they can be a balm; which do you choose to offer when given the opportunity? Jesus was the Living Word, revealing the heart and mind of God for all to know and experience directly. How can you be a living word of kindness to others, following in Jesus’s example? You don’t have to be a Christian to understand the positive, life-affirming impact your words can have on the world around you. The Dalai Lama has famously said that his religion is lovingkindness, and he has publicly expressed compassion and empathy to those who have oppressed him. 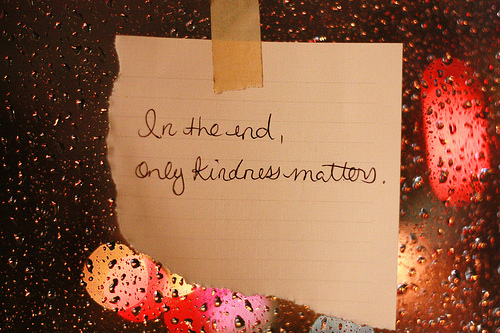 Always choose kind words that reflect the truth of your innate friendly, generous and warm-hearted nature. It’s already IN you! Tags: #24daysofgiving, Advent, kindness, Love, relationships. Bookmark the permalink.